It is known as breathing or ventilation. In this case, exchange of gases i.e. 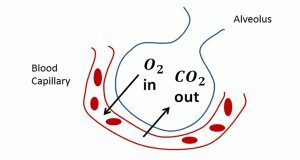 O2 and CO2 takes place through respiratory surfaces. The cellular respiration is directly involved in the production of energy for the living activities. In this process oxygen is utilized and CO2 is released. The energy released during this process is stored in the form of ATP. The gases are exchanged by diffusion during respiration. Active transport is not used during respiration. Respiratory gases are exchanged between body fluid and outside medium. The oxygen content of air is much higher than the oxygen content of the equal amount of water. A liter of water contains less than 10ml of oxygen. Whereas, fresh air has 200ml per liter. Oxygen diffuses about 8000 times more quickly in air than water. 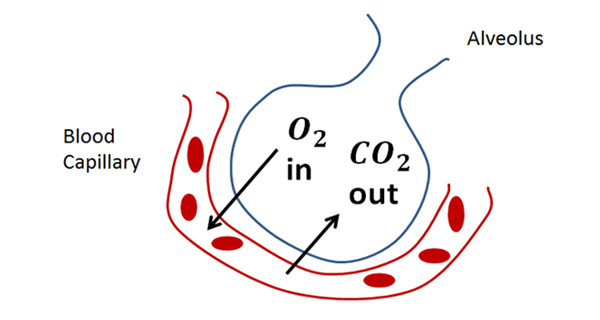 The exchange of gases takes place by breathing or ventilation. Water is 8000 times denser than air. Water is 50 times more viscous than air. So, the ventilation (gaseous exchange) in water is more difficult than the ventilation in air.